Professor Yamashiki served as a representative chair, and his laboratory personnel related to planetary science and oceanography made presentations. As an invited lecturer, Professor Naruse of the Graduate School of Science presented on the debris flow of Mars, and Assistant Professor Kodama at the University of Tokyo conducted the definition of a habitable zones considering water distribution of the planet. 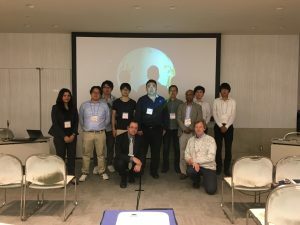 Assistant Professor Sasaki, from the Graduate School of Science, presented on the definition of a habitable zones on icy planets, and Professor Tom Scott at Bristol University introduced radiation mapping technology using AUV. Researcher Josko Troselj, from the Disaster Prevention Research Institute also made a presentation on the outflow from the ocean and the effects of tidal waves. Professor John Wells of Ritsumeikan University announced the influence of the Indian Ocean Dipole model (IOD) on the influence of the Indian Ocean summer monsoon rainfall (IMSR). From the laboratory, Shoji Ueda explored debris flow in a three-dimensional simulation using SPH, Shweta Yadav presented on the development of a method to discriminate submerged plants using remote sensing technology, and Ryusuke Kuroki presented on river outflow. Mr. Keiya Murashima (3rd year student of science) also made a presentation on the result of SPH calculations assuming the inner sea generation mechanism of the ice planet. 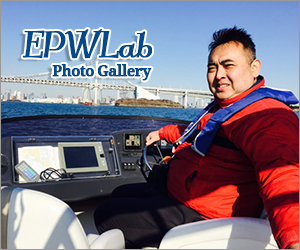 JpGU is a large academic gathering of researchers from all over Japan. The main purpose of this session is to promote discussion on mutual interaction between Continental zone and Oceanic zone. The global-scale material circulation induced by River runoff through oceanic general circulation as major topic on Continental-Oceanic Interaction, where the ENSO / IOD influence into continental climate as major topics on Oceanic-Continental Interaction. Numerical simulation and field observation of radionuclide transport from continental zone into ocean and its potential impact is also important topics of this session. The session also extend discussion on planetary hydrology and oceanography focusing on subserface ocean in Jupiter’s moon & Ancient Martian Hydrology. This year, in addition to the two distinguished invited talk (Martian debris flow inverse analyses by Professor Hajime Naruse and Inner Habitable zone definition by Dr. Takanori Kodama), we’ll have Deriving Radiological Transport Using Three-dimensional Radiation Mapping by Professor Tom Scott and Dr. Peter Martins at the University of Bristol. The topic covers, numerical simulation of tidal internal heat, numerical simulation of debris flow using SMP, IOD & IMSR analyses.